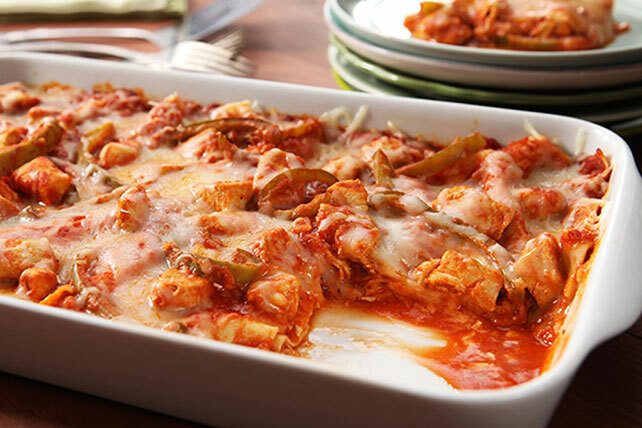 Oven-ready noodles and a prepared pasta sauce make this Everyday Easy Chicken Lasagna an everyday easy chicken entrée. Cook and stir chicken and peppers in hot oil in large skillet on medium heat 8 to 10 min. or until chicken is done. Stir in pasta sauce, water and 1 cup cheese. Spread 1/3 of the chicken mixture onto bottom of 13x9-inch pan sprayed with cooking spray; cover with 3 noodles. Repeat layers twice. Top with remaining cheese. Serve with crisp mixed salad greens tossed with cut-up fresh vegetables and your favourite Kraft Dressing. Prepare using a red pepper.